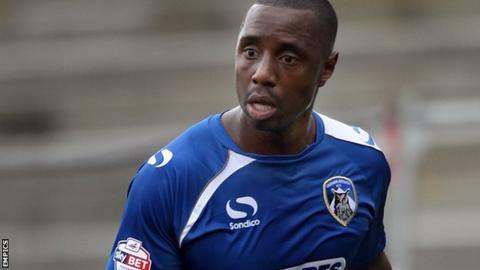 Jonathan Forte came off the bench to rescue a point for Oldham at Walsall. Romaine Sawyers gave the hosts an early lead with a powerfully struck drive, following good work from Tom Bradshaw. Andy Taylor sent a free-kick wide for Walsall and Liam Kelly twice went close in response before Forte eventually volleyed home the leveller from a Jake Cassidy cross. Bradshaw almost won it for the Saddlers, but sent a last-minute effort off target. "I thought we showed great character, especially after going 1-0 down. "I thought after about 15 minutes we started to build momentum, started to take the game to them, started to take over and I think, to be honest, we were unlucky to come away with just a point. "The key to anything is keeping the ball in possession and being patient with what you're trying to do." Match ends, Walsall 1, Oldham Athletic 1. Second Half ends, Walsall 1, Oldham Athletic 1. Corner, Oldham Athletic. Conceded by Andy Taylor. Attempt missed. Tom Bradshaw (Walsall) left footed shot from outside the box is too high. Liam Kelly (Oldham Athletic) wins a free kick in the attacking half. Substitution, Walsall. Anthony Forde replaces Rico Henry. Sam Mantom (Walsall) wins a free kick on the left wing. Foul by Danny Philliskirk (Oldham Athletic). Goal! Walsall 1, Oldham Athletic 1. Jonathan Forte (Oldham Athletic) left footed shot from the centre of the box to the bottom left corner. Assisted by Jake Cassidy. Attempt saved. Milan Lalkovic (Walsall) right footed shot from outside the box is saved in the centre of the goal. Sam Mantom (Walsall) wins a free kick in the attacking half. Foul by Michael Jones (Oldham Athletic). Corner, Walsall. Conceded by James Wilson. Attempt saved. Milan Lalkovic (Walsall) right footed shot from a difficult angle on the left is saved in the bottom left corner. Substitution, Oldham Athletic. Danny Philliskirk replaces Lee Croft. Dangerous play by James Wilson (Oldham Athletic). Foul by Sam Mantom (Walsall). David Dunn (Oldham Athletic) wins a free kick in the defensive half. Delay in match Joseph Mills (Oldham Athletic) because of an injury. Foul by Lee Croft (Oldham Athletic). Milan Lalkovic (Walsall) wins a free kick in the defensive half. Foul by Jonathan Burn (Oldham Athletic). Substitution, Oldham Athletic. David Dunn replaces Carl Winchester. Substitution, Walsall. Milan Lalkovic replaces Jordan Cook. Attempt blocked. Lee Croft (Oldham Athletic) right footed shot from the right side of the box is blocked. Substitution, Oldham Athletic. Jonathan Forte replaces Rhys Turner. Liam Kelly (Oldham Athletic) wins a free kick in the defensive half. Corner, Oldham Athletic. Conceded by James O'Connor. Attempt saved. Joseph Mills (Oldham Athletic) right footed shot from outside the box is saved in the centre of the goal. Attempt missed. Michael Jones (Oldham Athletic) left footed shot from outside the box misses to the left. Attempt missed. Andy Taylor (Walsall) left footed shot from outside the box is close, but misses to the left from a direct free kick. Tom Bradshaw (Walsall) wins a free kick in the attacking half. Foul by Liam Kelly (Oldham Athletic). Romaine Sawyers (Walsall) wins a free kick on the right wing.